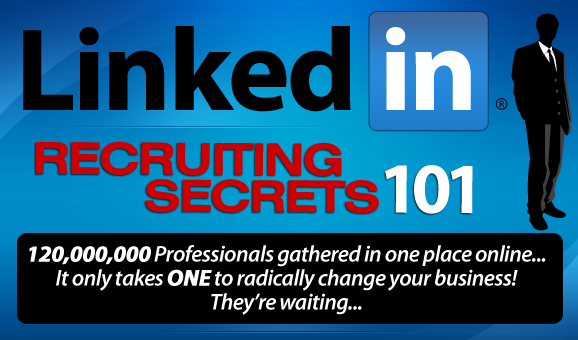 LinkedIn Recruiting Secrets – Master LinkedIn for Home Business Recruiting – Launch Special! Exclusive Membership Access to 24 Videos Plus 3 Hour Webinar & Bonus Downloads! 3 hour audio visual online membership training Plus 24 Step-by-step instructional videos and how to’s on Mastering LinkedIn for Recruiting – 24/7 access. Did you know that there are 120 MILLION Professionals on LinkedIn®? Did you also know that the average LinkedIn® professional makes over $107,000.000 a year? between 35 and 54 years old? Did you know there are over 18 Million Decision Makers? What if you could learn the LinkedIn® Recruiting Secrets of a #1 Corporate Recruiter? Only $97 – Launch Special! Act Now!